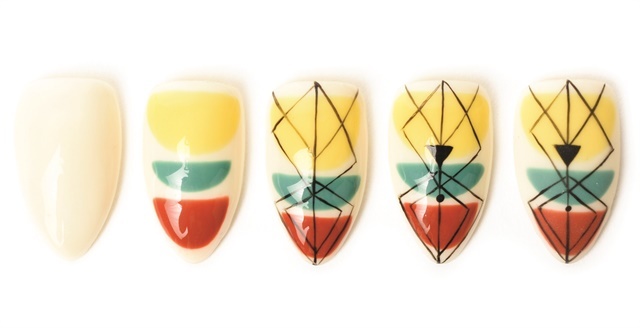 This matte tribal nail art is trendy and chic. 1. Paint entire nail with OPI My Vampire is Buff. 2. Carefully paint three triangles, each in a different color. From bottom to top, paint red, green, and yellow using OPI It’s a Piazza Cake, My Dogsled is a Hybrid, and Need Sunglasses, respectively. 3. With a thin striper brush, paint two parallelograms to make an 8 shape. Outline the top shape with another parallelogram. Paint a thin line down the center of the nail. Draw two lines extending from the center line to make an arrow shape. 4. Draw a thick dot on the bottom portion of the middle line. Draw a thick, solid triangle on the top portion of the middle line. 5. Use Laque’d Gel Matte Top Coat to finish the design.